Thank you, Esmé for the warm invitation to share one of my all-time favorite recipes on your blog. You know my recipe had to be fairy related because I write young adult fantasy novels that share the stories of the elemental fairy nymphs. This recipe was a staple in my kitchen when our five children were still at home. I have been lucky enough to share this treat with my grandchildren, but with a few tweaks from the original recipe. These bars are as light as a fairy’s wings and will take you back to a time when you were a child. In the last year, I have developed a resistance to dairy (not eggs – only milk related products) and wheat. I experience all the symptoms of having a gluten and dairy intolerance. The good news is that I have been able to find cheese products that do not contain milk. I purchase gluten-free bread and flour and watch the ingredients in the other products I buy carefully. Yet, I often struggle to find affordable ingredients that are gluten free. However, these fairy treats don’t cost much more than the original version. I did some quick calculations and realized that butter seemed to disrupt my digestion. It occurred to me that coconut oil might be the perfect solution to my issue. So, below is the recipe that has enabled me to still have a sweet treat with my tea each evening. It’s simple, easy, and you can freeze the bars, so you aren’t tempted to overindulge. This recipe is so straightforward and versatile. You can keep the bars plain or add to them and make them as fancy as you want. I follow Weight Watchers Smart Points and a 2 inch by the 2-inch square is about 4 Smart Points. I know that sounds small, but the size should be about the same as the store bought-version to calculate the Smart Points values. I use the largest mixing bowl I have in my house to melt the ingredients. I measure the coconut oil and melt it in the microwave. Usually, one minute is sufficient to melt the oil. Next, I measure the 6 cups of mini marshmallows and add them to the bowl containing the coconut oil. After one or two minutes (depending on the wattage of your microwave) the marshmallows are melted. I use a cooking spray like Pam to spray the pan that will hold the fairy treat mixture. I also coat the spoon with the cooking spray so the marshmallows don’t stick to it and make a mess. I measure the 6 cups of Rice Krispy cereal and mix them in with the marshmallows and oil. Next, place the mixture into a pan and pat down firmly. If I’m making this treat for my grandchildren, I often add chocolate chips, chocolate jimmies, colored nonpareils, edible glitter or edible confetti. There are many edible cookie decorations that you can add to these fairy treats. I have used different shaped pans and containers also for special effects. Once these fairy bars have set, I cut them into 2″ X 2″ squares. I use sandwich bags for freezing. You can fit a couple squares in each bag. These fairy treats can be stored for two weeks at room temperature in an airtight container. You can freeze them for up to six weeks. How COOL is that? Check out the official Rice Krispie Treat website HERE for more ideas. Thanks again for the kind invitation to share my favorite treat, Esmé. I loved visiting and will be on the look out for further “fairy” related dishes to share. 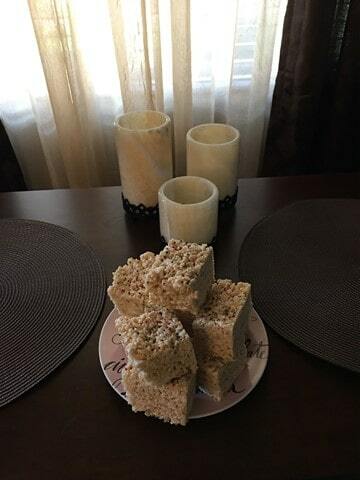 Love rice krispy treats always one of my favorite treats! My pleasure as always Ms. Esme. Thanks for sharing that tip, I will for sure check it out, as my one grandson (vegan) will just love this tractor idea. Hope you will try and enjoy this treat Adele.